Some of Zoo’s animals know how to turn up the heat. Updated Feb. 8, 2019 - It may still be winter, but a few species at the ABQ BioPark really know how to turn up the heat when it comes to romance. Here’s a list of BioPark creatures with the most romantic mating rituals. 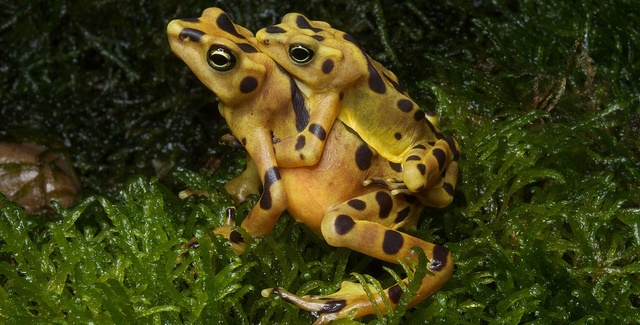 Most people enjoy being embraced by their partner, but the Panamanian golden frog takes embracing to the next level. Females listen for special mating calls from males—if she likes what she hears, she will let the male hitchhike on her back as she goes about her business. This is called amplexus (Latin for “embrace”). When she is ready to produce eggs, she’ll lay them in a string and her mate will fertilize them simultaneously. You’ll never hear a siamang call quite like that of the ABQ BioPark Zoo’s Brian and Johore. That’s because there really is no other song like it—each monogamous siamang gibbon pair has a unique duet. The two welcomed babies Tika in 2014 and Eerie in 2017. 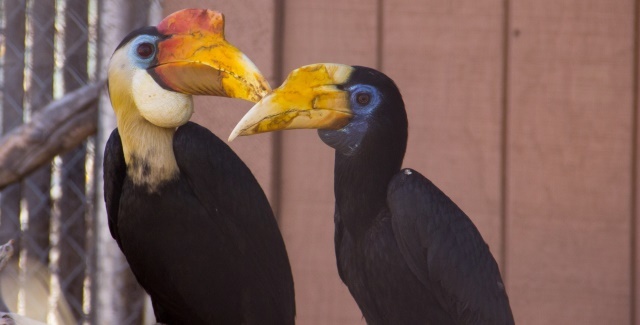 The ABQ BioPark’s two wrinkled hornbills seem to enjoy each other’s company—they follow each other from branch to branch and even engage in a little flirtatious “bill slapping” (this is when the two birds gently “slap” bills with each other). The two even successfully bred in 2014, 2016 and 2017. This species has an interesting behavior when a female is pregnant, though—males “mud” the females into a hole in a tree and feed them through a slit. Although usually solitary, both sexes come together to bellow choruses during mating season. These “songs” last about 10 minutes and are sung in unison.